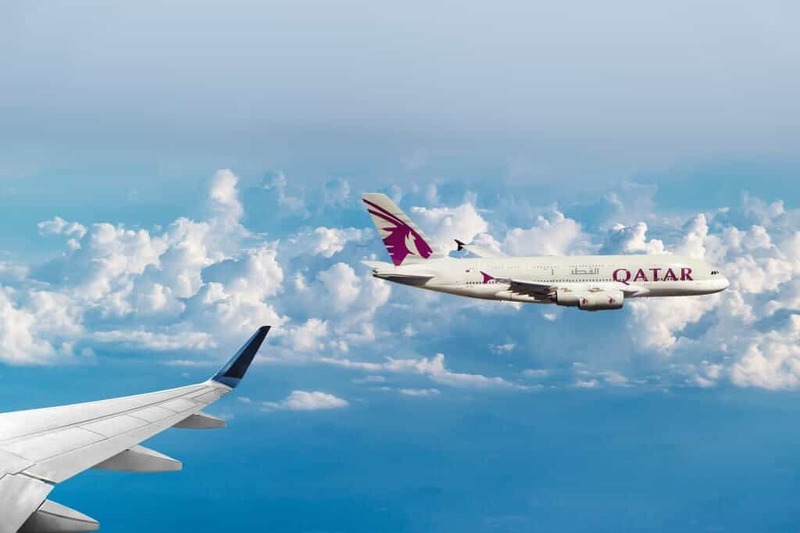 If you are flying with a baby on Qatar, then here is all the information you need to know about the airline – in one convenient place. This guide covers airplane bassinets, baggage allowances, baby food, car seats, child restraint devices, strollers, toys, entertainment and more. For general flying with a baby tips see here. What age can an infant fly on Qatar Airways? What is the Qatar Airways baggage allowance for infants? What is Qatar Airways stroller policy? Can I bring a stroller on Qatar Airways? Can I bring a stroller and car seat free of charge as checked baggage? 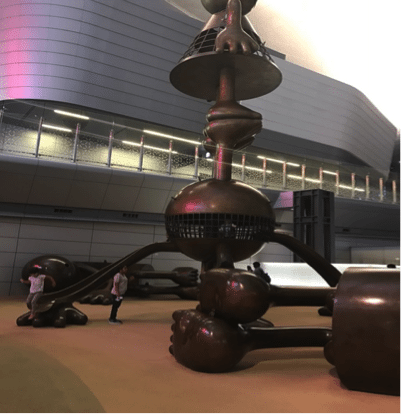 Does Qatar Airways have complimentary strollers at Hamad International Airport, Doha? Can I use a car seat on Qatar Airways? Do I need to purchase an aircraft seat in order to request a Child Restraint Device (CRD) from the airline or to use my personal car seat? What is a Child Restraint Device? 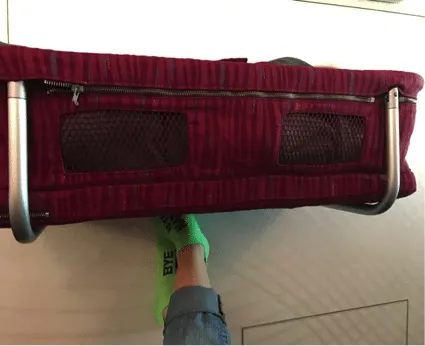 What does a Qatar Airways bassinet look like? What is the Qatar bassinet weight limit? Where are the Qatar Airways baby bassinets located? Does Qatar Airways have a kids’ club? I’m in transit at Doha Airport. What can I do? a. When travel is required on Medical Grounds provided Qatar Airways Medical Centre approval is obtained using a MEDIF. b. When the mother is required to travel on compassionate grounds provided a Certificate is obtained from a Qualified Pediatrician indicating the infant is fit to travel and necessary travel documents for the infant is available. Yes you can free of charge. If your car seat does not exceed a max dimension of 115cm then it can be brought for free as per the guidelines above. Qatar Airways offers baby strollers at Hamad International Airport. They provide disposable covers as well. 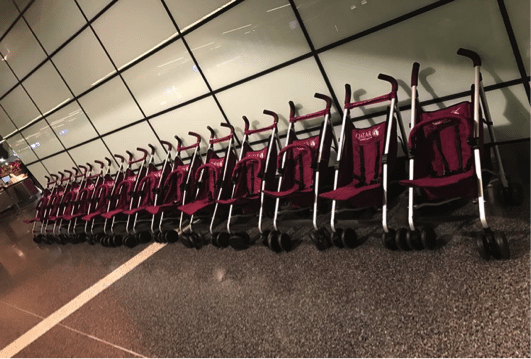 Customers who are transiting or arriving at Hamad International Airport can find baby strollers/ buggies at the arrival hall, immediately following your disembarkation of the bus. Customers departing from Hamad International Airport: strollers can be requested during check-in and brought to you prior to proceeding to immigration. Car seats may be used for infants and children aged between 6 months and 36 months only. A seat must be purchased at a child fare and be airline approved. There is a child restraint device available on Qatar Airways. You need to pay the appropriate child fare for the extra seat in case you need to use CRD or car seat for your infant. It is a special airline chair for children over 6 months of age which must be requested and a seat must be bought. Please read this detailed post on CRD. Airline bassinets are by request only. This is the case with every airline. If you have booked your ticket on qatarairways.com, you can select your seat from the booking confirmation page upon completion of your booking. You can also set your seat preference through “Manage Booking” on qatarairways.com. Enter your last name and booking reference number to retrieve your booking, then select “modify seat selection” to choose your preferred seat. Another option is to contact your local Qatar Airways office to request a bassinet seat. The maximum weight of the infant should not exceed 11kgs (24 Lbs) and the age must not exceed 24 months. Additionally, the infant must fit within the confines of the baby bassinet. Find out more airline bassinet weight restrictions here. If you click on the Qatar Airways fleet information and scroll down to the fleet map table, then click on View map to see the seat layout. Bassinets are in the bulkhead positions which separate a cabin or cabin/ galley area. Bassinets are not available in the First Class cabin on-board the Airbus 380. To check availability of a bassinet position seat on a specific aircraft and within a particular cabin, please contact your nearest Qatar Airways office. Like most long haul airlines, Qatar Airways provides child meals to kids over the age of two. These must be pre-requested at least 24 hours in advance. The plastic meal box contains a main meal, a fruit juice and fun treats. The meal packs currently feature some of the characters from Hasbro. Main meals are typically pasta, chicken etc. Qatar Airways provides a baby meal for infants. This is pureed food in jars. This generally needs to pre requested at least 24 hours before your flight. However, parents travelling with infants will have access to Qatar’s special kit, which includes diapers, baby food jars, a bottle and soft toys. Be aware contents can be limited so it is always best to bring your own. If you have a weaned child under two, travelling as a lap baby, you will need to bring food for them. In an emergency a very limited amount of baby formula is carried on board, but please do bring your own. Qatar Airways have recently revamped their Oryx Kids’ Club – which includes toys, activity packs and meals boxes for all their routes, not just long haul. Babies are offered a soft plush toy and book. For more travel toys ideas see here. If you are in transit and have a few hours to spare, you can even enjoy family time together at the indoor swimming pool, located in the Oryx Airport Hotel. There are several children’s play areas throughout the airport. They have child sleeping pods with sofas, bean bags and TV’s playing cartoons. For more details and personal experience on flying with a baby on Qatar Airways review see here. Thank you so much for your awesome information! I’m also one travelling fairly regularly with an almost-2-year old and 4 year old and am always on the lookout for tips! I just wanted to offer some corrections to your Qatar Airways flying with a baby page. Firstly, in addition to 10kg luggage allowance, infants can take ONLY ONE additional item. EITHER stroller, travel cot, car seat etc. If you wish to take more than one baby item (ie both stroller and travel cot) it will be counted as part of the 10kg luggage. Secondly, you are unable to book the bassinet seats yourself. The only way to do this is to call the ticketing office and they will put in a REQUEST on your booking. Then its actually the check in staff who can finally confirm the bassinet seat. The bulkhead/bassinet seats are blocked online so its actually impossible to select them. The tip — CHECK IN EARLY!! Thanks again for the fantastic information. Its extremely helpful!